Welcome to Illinois Women in Leadership! Join over 200 professional female leaders serving Springfield and the surrounding area. Become a member of IWIL today. 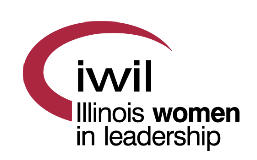 What is Illinois Women in Leadership (IWIL)? IWIL exists to promote professionalism and develop members' leadership and management abilities. This is done through education, mentoring, networking, member participation, encouragement as well as support, friendship and community involvement. Join us for our next program in April, all members and guests are welcome to attend our monthly luncheons. It will be held Thursday, April 18 at 11:30 a.m. at the Sangamo Club in Springfield. Click here for registration & details. IWIL, I CAN & I DO! Our organization is completely volunteer-led, from the Board of Directors, to special event volunteers, to our Scholarship Committee. Joining a committee is a great way to get to know other IWIL members and serve our community. We host several large-scale events each year including the Women's Symposium and ATHENA Leadership Award, and we need YOU to make each of these a success! If you have a desire to learn new professional skills or would like to grow personally, there is a way for you to contribute as an IWIL committee member.